For many people their gardening efforts are repeatedly frustrated by the attention of ravenous hordes of rabbits. With a few alterations and some careful planning the Lagomorphic tide can be turned. Rabbits and hares are very effective plant destroying machines, not merely eating enough to get-by, their insatiable appetite for new things and destruction causes much damage throughout the garden. Speculative chewing of nearly everything to find what tastes best, the uprooting of new plants, the stripping of bark from trees, and of course digging holes in your lawn for you to turn your ankle in, all make rabbits many gardener’s most hated enemy. So what can be done? 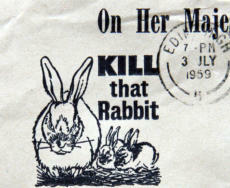 You could find a good recipe for rabbit stew, get an air rifle or ferret and go on a spree, though as everyone knows nothing breeds quite like rabbits and in most locations new bunnies will soon move in to replace the killed ones. The best long-term answer to a rabbit problem is to protect your garden as best as is practicable by fencing. Erecting a rabbit-proof fence is a time consuming process and hard work involving a lot of digging, but it is still the best way to protect your garden where total rabbit eradication is not an option. A chain is only as strong as it’s weakest link and a rabbit-proof fence is not rabbit-proof if it does not entirely surround the garden. Rabbits are small, flexible and wily creatures just waiting to exploit any chink, so check the fence regularly and patch holes. 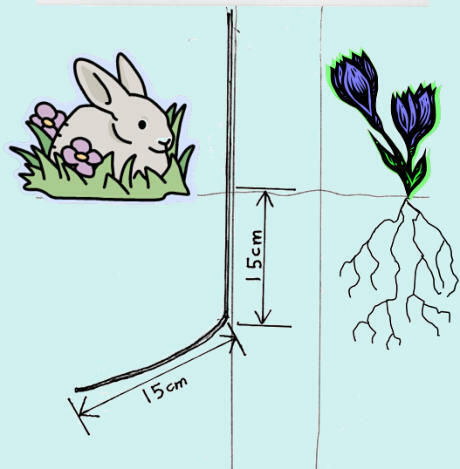 Rabbits and especially hares are accomplished jumpers so any fence should be 4’-5’ (120-150cm) high above ground, of a galvanised hexagonal mesh with gaps of not more than 1” (25mm) in diameter. The tricky and time consuming bit is the digging down to sink the bottom 1’ (30cm) of the fence into the ground, bending the lower 6” (15cm) outwards to discourage them burrowing into your green and pleasant land. The posts need not be as stout or as deeply driven as a stock or deer fence, but you still don’t want it to fall over! Round 2” (5cm) posts at 7-10’ (2-3m) spacing should do, though thicker post will last longer. Where fencing and eradication is not a practical option one must learn to live with the rabbits and to garden with them in mind. Flower beds may be somewhat protected by small enclosures of fencing. For individual trees tree guards may be used, these are available in several designs, all ugly. They form a cylinder of mesh or solid plastic around the trunk to keep the rabbits and hares out, other designs work by wrapping a stiff self-expanding spiral of plastic around the trunk of your young tree to prevent ring barking. There is probably no such thing as a truly rabbit-proof plant, they will usually try something before deciding they don’t like it. Hares are particularly selective eaters and by careful avoidance of planting rabbit fodder and sticking to that which is poisonous or unpalatable something resembling a garden can emerge. Where a rabbit visitation is an occasional rather than frequent event using a good number of rabbit-resistant plants in the most accessible areas of the garden may well be more sensible than spending lots of time and money on a fence. 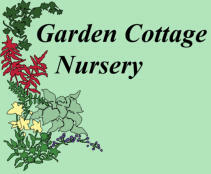 We have come across many lists of so-called rabbit and deer-proof plants in our time and for nearly every plant on those lists someone has told us how the rabbits, hares, sheep or deer always make a bee-line for it. Still there are plants that are definitely preferred over others, different populations are reputed to have different tastes so what works in some places may not be so effective elsewhere. Some of these resistant plants are toxic to humans too, so parents and grandparents with little people running around might also wish to avoid them. Below is a fairly long list of the plants less likely to be bothered by rabbits and other grazers, all will generally grow well in Wester Ross, though some will want some shelter from salt winds. Members of the iris family, Iridaceae, are pretty much disliked by everything, so irises themselves, Crocosmia and Libertia are worth a go, many of the buttercup family, Ranunculaceae are poisonous or inedible so try Aconitum, Anemone or Clematis. Where fencing and eradication is not a practical option one must learn to live with the rabbits and to garden with them in mind. Flower beds may be somewhat protected by small enclosures of fencing. For individual trees tree guards may be used, these are available in several designs, all ugly. They form a cylinder of mesh or solid plastic around the trunk to keep the rabbits and hares out, other designs work by wrapping a stiff self-expanding spiral of plastic around the trunk of your young tree to prevent ring barking. There is probably no such thing as a truly rabbit-proof plant, they will usually try something before deciding they don’t like it. Hares are particularly selective eaters and by careful avoidance of planting rabbit fodder and sticking to that which is poisonous or unpalatable something resembling a garden can emerge. Where a rabbit visitation is an occasional rather than frequent event using a good number of rabbit-resistant plants in the most accessible areas of the garden may well be more sensible than spending lots of time and money on a fence. We have come across many lists of so-called rabbit and deer- proof plants in our time and for nearly every plant on those lists someone has told us how the rabbits, hares, sheep or deer always make a bee-line for it. Still there are plants that are definitely preferred over others, different populations are reputed to have different tastes so what works in some places may not be so effective elsewhere. Some of these resistant plants are toxic to humans too, so parents and grandparents with little people running around might also wish to avoid them. Below is a fairly long list of the plants less likely to be bothered by rabbits and other grazers, all will generally grow well in Wester Ross, though some will want some shelter from salt winds. Members of the iris family, Iridaceae, are pretty much disliked by everything, so irises themselves, Crocosmia and Libertia are worth a go, many of the buttercup family, Ranunculaceae are poisonous or inedible so try Aconitum, Anemone or Clematis.